Rhinoplasty, or nose reshaping surgery, improves the shape, size, and symmetry of a person’s nose, bringing it into better proportion with the rest of the face. Cosmeticium is one of the main clinics who offer breast rhinoplasty surgery in İstanbul, Turkey. In preparation for a rhinoplasty surgery, we recommend our patients avoid caffeinated drinks to help keep body hydrated and enhance the healing process. The upper lip can sometimes be numb after the surgery, so it’s important to be careful with hot drinks and soup. Finally, you’ll want to have plenty of ice on hand, which can help with dry mouth as well as any nose bleeding. Also, critical to rhinoplasty preparation is meeting with your plastic surgeon to make sure you’re prioritizing your health and safety because recovery from any plastic surgery procedure can vary between patients. In some situations, patients may need to have lab testing done to ensure they’re healthy; this is most common among older patients. As a rhinoplasty patient, you may also be advised to take certain medications, adjust medications levels, or to stop smoking. You may also be advised to discontinue the use of aspirin, anti-inflammatory drugs, and herbal supplements, all of which can cause internal bleeding. called “primary rhinoplasty.” Rhinoplasty performed to address concerns or deformities resulting from prior nose surgeries is referred to as a “revision rhinoplasty”. The procedure is carried out under general anaesthesia and it should take around 2 hours. Many nose surgeries involve making tiny cuts inside the nostrils; this is closed rhinoplasty. For this type of procedure, visible signs of surgery are minimal. Nose surgeries which cut across the skin, between the nostrils (open rhinoplasty), may leave fine scars. Once the procedure is complete, the skin on the nose will then shrink or expand around its new shape. Proper aftercare is recommended. Surgery of the nose can reduce or augment nasal structures with the use of cartilage grafted from other areas of the body. If the septum is deviated, it is now straightened and the projections inside the nose are reduced to improve breathing. For approximately 5 days following surgery patients will wear an external splint on the bridge of their nose, and some internal tubular splints inside the nose. Apart from some swelling of the nasal passages, if the airway is kept free from build-up there is no reason why the patient wouldn’t be able to breathe freely through the nose in this time. Sun exposure, smoking and alcohol are all things to avoid for a long as possible during your healing process. Your facial skin will be highly susceptible to sunburn and pigmentation, meaning any damage or changes could be permanent. Plenty of fluids and good nutrition are also compulsory to aid healing, though step-by-step advice and information will be given to you according to your medical background and the severity of your procedure. It may take several months for swelling to fully dissipate and up to a year – and sometimes longer – for the outcome of the surgery to fully refine. Although the results of nose surgery are usually permanent, cartilage may continue to reshape and move tissue that may change the outcome over time. Rhinoplasty, or nose surgery, is a surgical procedure designed to improve the appearance of the nose and sometimes the function of the nose as well. 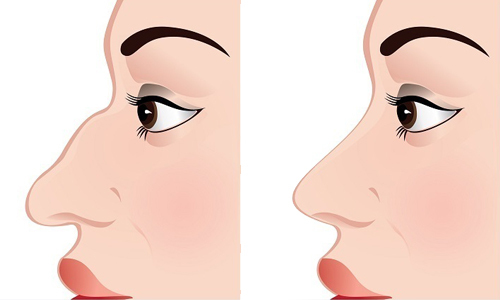 The nose can be altered by reducing or increasing the overall size, removing a hump, changing the angle between the nose and the upper lip, changing the shape of the tip or the bridge, or narrowing the span of the nostrils. Some breathing problems may also be treated during the rhinoplasty procedure. Physically healthy men and women who have realistic expectations and are interested in improving the appearance and/or function of the nose are potential candidates for rhinoplasty. Rhinoplasty is often postponed on younger patients until the nose has completed its growth, which is around the age of fourteen for girls and a bit later for boys. Are there any age restrictions for undergoing rhinoplasty? It’s generally advised that rhinoplasty not be performed on younger patients until the nose has completed its growth. This tends to occur around the age of fourteen for girls and a bit later for boys. What can I expect during a consultation for rhinoplasty? General anesthesia or a combination of local anesthesia and sedation may be used for rhinoplasty. Incisions are made either within the inside of the nose or both inside of the nose and one small one under the tip of the nose. The skin is then separated from the underlying bone and cartilage, which is then sculpted to the desired shape. The skin is redraped over the new framework and the incisions are closed. Rhinoplasty generally takes between one and two hours to complete. Incisions may be solely confined to the inside of the nose, which is referred to as closed rhinoplasty. Sometimes an additional small incision under the tip of the nose is also required, which is referred to as open rhinoplasty. Open rhinoplasty may be preferred in some cases if it can provide better exposure and an overall better result. Other cases, however, can be performed with closed rhinoplasty. Surgical incisions will results in scars. However, for closed rhinoplasty the incisions are confined to the inside of the nose and result in no visible scarring. Open rhinoplasty includes an additional small incision under the tip of the nose which will result in a well-concealed, fine-line scar that will fade with time. Patients may experience some discomfort during the first few days after surgery, but this can be controlled with prescription pain medication. Will I need someone to help me out at home after rhinoplasty? During the first couple of days after surgery, some discomfort can occur though this can be controlled with prescription pain medication. Antibiotics and other medicines, such as a saline nose spray, may be prescribed as well. The splints and stitches are typically removed within six or seven days after surgery. Patients may also experience some bruising which will fade enough so that you feel comfortable in social situations by around the tenth day after surgery. Swelling is common and may take months to fully fade. Within one to two weeks most patients can return to work. However, it will be two to three weeks before more strenuous activities can be done. Patients are typically able to return to work within one to two weeks after rhinoplasty. Exercise and other strenuous activities can usually be resumed within two to three weeks after surgery. When are the stitches removed after rhinoplasty? Some of the potential complications associated with rhinoplasty may include the following: adverse anesthesia reactions, incomplete improvement, infection, small burst blood vessels, and the need for additional surgery.